A screen capture of the Film Freeway website. 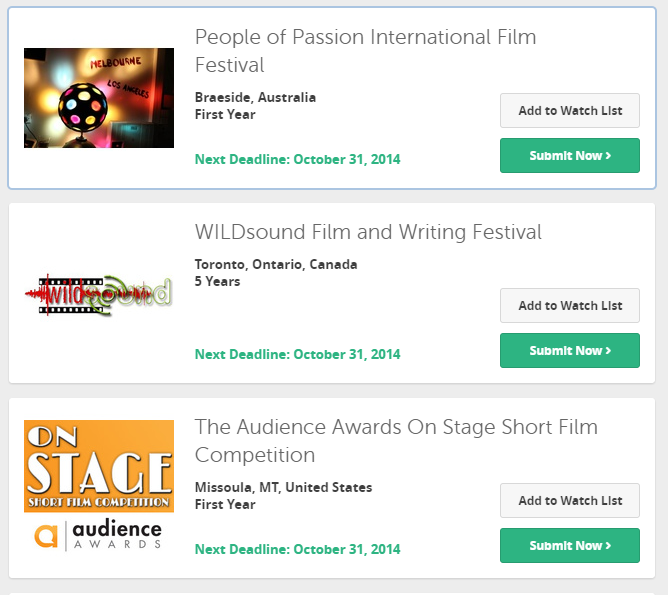 One of the best ways for a filmmaker to get their work seen is to enter film festivals. No doubt you’ve heard of the big film festivals like the Sundance or Cannes, but what if you’re just starting out and want something smaller, less competitive or more local? Never fear, there are well over a thousand to choose from. Some are free to enter. Finding them can be easy. There are several websites to help you locate festivals that are right for your project. A website calling itself the Film Freeway offers users information on over 1,300 festivals around the world. They give you all the information you need to know about each festival, the categories accepted, plus all the rules, prices and entry fees. Film Freeway does not charge anything to use their site. You do not have to give up any of your rights of ownership to your film. 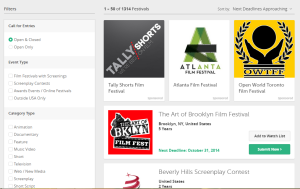 The site has features that allow you to upload and enter your film into some of the festivals. Another screen capture of the Film Freeway website. Another site that lists lots of festivals is called Click for Festivals. Much like the Film Freeway, Click for Festivals is also a free tool and allows you to upload your video to the site. If your project is under 8 minutes in total length, you can submit it to a weekly festival sponsored by the public television station in New York, WNET. This festival is free and winners are determined by an online vote. If no budget filmmaking is your cup of tea, another festival to check out is the No Budget Film Festival. According to their “about us” page, the festival was begun as “…an experiment in independent filmmaking in the purest sense.” This festival has grown into a fairly big event since its inception in 2010. All in all, Film Festivals are an excellent resource for the filmmaker who wants to have their work seen. So go check it out these websites and see what festivals are right for your project. Good luck with all your video making efforts. Sign up for my free course to begin your journey to becoming a professional quality video maker. You can sign up from any page on this blog.